This question from reader Allison was a bit out of my realm of experience, but I was able to locate some helpful resources. Question: "I am trying to find someone who can tell me the best way to clean dried moss or straw on a flower arrangement? I have a couple favorite flower arrangements from my mom who recently passed and I am worried they have "something" in them, How do you dust spaghnum moss or straw that is on the base of a silk plant?" 1. Use a scissor to remove any obviously moldy or mildewed pieces of moss or straw. In my experience, mold is difficult to "slow down" so removal might be your best bet. 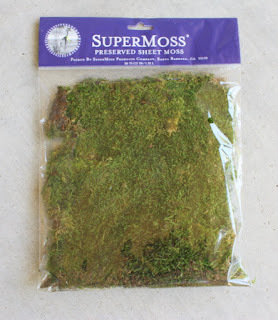 Perhaps you could clip out the worst pieces and replace them with new dried florist moss? 2. Attempt to dust the dried moss by blasting it with air. You can try a compressed air duster (sold at office supply or computer stores - for cleaning computer keyboards). If you use one of these they typically have a nozzle for pinpointing the blast. Another suggestion I saw was to use a hair dryer on the cool or gentle level. Be sure to wear protective eye gear! You don't blow that stuff in your eyes! 3. Your arrangements sound very special and from a preservation standpoint, you may want to contact a professional for advice on how to best store and maintain them in future years. A craft store or florist that works with dried flower arrangements may have ideas for how to spruce up the arrangements or treat them for continued preservation.